Ovila Abbey Saison | Sierra Nevada Brewing Co.
A: Slightly hazy, brassy golden color that is perpepually backlit by a steady orange flame. Over two fingers of eager white foam collapse to a persistent and continuous double membrane. Scant lacing remains on the glass. S: Abundant bready yeast, with heaps of organic aromas that place esters ahead of phenolics. Fruit is a combination of almost anything of temperate origin that is yellow or orange in color. Spice is relatively passive, perhaps some nutmeg, clove, and whole coriander seed marrying well with the fruit. Dried citrus peel adds freshness to other flavors, but bear little resemblance to typical American hop aromas. T: Begins off-dry, with soft and refined pale malt that features a whiff of raw almonds. Bright Belgian esters soon advance, doubtless bolstered by the smell, but yield more ground here to balancing chemical astringency and even some mild black pepper. Acidity remains behind the scenes, never revealing itself openly but causing fruit flavors to peak in tartness toward the middle. Some faint fusel alcohols also flee just prior to the midpoint. The finish is fairly crisp, drying somewhat, with mild herbaceous bitterness. M: Medium viscosity, very smooth and creamy on the palate, with moderate carbonation. D/O: This is a fairly decadent saison, tasting like a stronger version of the style than it actually is. Yeast is clearly featured, developing heavy layers of fruit that border on cloying at times. Although it makes a late effort, this saison offers up a little too much sweetness from start to finish. The layers of sweet fruit that seem heavy for the abv may suggest under-attenuation, but the overall appeal offered by this beer will likely place the drinker in a forgiving mood. A: Hazy, burnt orange with an off white, one finger head that lingers. Good lacing. S: Belgian yeast, oranges, coriander. T: Citrus, light, oranges/lemons, coriander, Belgian funk. A peppery finish. M: Medium with lots of carbonation. O: A decent saison. I like the Ovila dubbel and quad better, but this was worth a try. A: Rather cloudy pale amber-yellow in color. Forms a modest white head that does seem to stick around fairly well. No lacing. S: Bright and slightly acidic with notes of lemon, black pepper, spice and a bit of yeast. T: Rather mild and unassuming. Starts off with very mild, slightly fruity, pale malts before turning herbal and peppery. Then a hint of lemon and a light bit of yeast with lots of pepper on the finish. M: On the lighter side with heavier carbonation, a spry mouthfeel and virtually no bitterness. O: An acceptable, approachable, Saison: I've had better and I've had worse. Poured into a Black Raven pint glass. Pours a slightly cloudy orange amber with a thick one finger white head and lacing. Looks nice. Fairly complex aroma of caramel malt, banana, light fruit and Belgian spices. Starts with a medium sweet malt and light fruit flavor and abruptly finishes dry with pepper, citrus, a hint of funk, Belgian spices and a light hop kick. A very different flavor progression. A bit too dry on the finish for my taste, but very well made and interesting enough to keep my interest. maybe my least favorite from this series, but not a bad beer at all. it pours a very pale cloudy yellow color with a smallish white head. the aroma is grassy and wheaty, more of a hefeweizen in the nose than a saison, kind of missing that farmy aspect. the flavor is also quite grassy, like cut hay or something, more in the malts than in the yeast. there is a touch of lemon acidity to this as well, but the flavor is quite mild overall. mouthfeel is a tad undercarbonated i think, but the body is light and easy drinking. maybe the season has passed for light saisons, but this one didnt really do it for me. i much prefer the other beers in this line. Took this out of the fridge 30 minutes before drinking to warm it up a bit. A: Pours a honey color, slightly on the orange side. Carbonation streaming from the bottom of the glass to support the fluffy light tan head. S: Smells like a Belgian beer. Yeasty, tart fruits, and maybe a little pepper dominate the aroma. Smells quite wonderful. T: I don't get as much funk as I like in my Saisons. There are hints of hay and oats, and defiantly grassy notes too. Just didn't deliver on what the aroma promised, kinda sad really. M: Very light bodied (almost creamy) and carbonated, also incredibly smooth, neither of which I was expecting. I don't think this fits the style very well. D: Quite drinkable, but I'd rather have other saisons. Pours a nice mix of orange and yellow, with a brilliant white spongy head. Aroma notes of lemon zest, Belgian yeast, light pepper and herbal notes with a tiny bit of juicy citrus. Taste is nicely peppery, with a predominant yeast note. Slight bits of fruity esters, herbs and lemon rind. Crisp, but far from effervescent. Carbonation is more tame than I see in other Saison examples. Feels good on the palate though. Drinkabilty is high. I definitely enjoyed this Ovila offering over the Dubbel (though my girlfriend would argue otherwise!). It's not a top tier Saison, but it's very good, drinkable and refreshing in this heat. 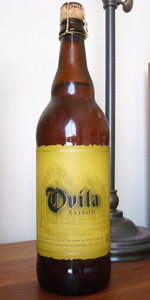 Ovila Abbey Saison from Sierra Nevada Brewing Co.